The military crackdown in Burma is a reminder that street demonstrations do not necessarily lead to success for popular uprisings. The key factor is the destabilisation of the existing regime and if protests cannot bring that about, they become vulnerable to the kind of repression the Burmese authorities have imposed. So far, the Burmese military has held together. The campaign for democracy in Burma still hopes for rapid success but fears that the project will be more long-term. In our day, we have perhaps become so used to seeing pro-democracy protestors toppling authoritarian governments that the difficulties involved can be underestimated. External pressure from key countries able to exert influence. Experience has shown that a combination of the above is usually necessary for success. In Eastern Europe in the late 1980s, for example, several factors came into play. There were the protests, the communist governments were exhausted, reformers came to the fore, the Soviet Union under Mikhail Gorbachev withdrew its support and the local security forces switched sides. However, in Uzbekistan in 2005, protests in the city of Andijan were swiftly repressed because they did not lead to wider influences being brought to bear. And in China in 1989, the democracy demonstrators in Tiananmen Square were eventually dispersed by force because the Chinese government cracked down instead of cracking up. 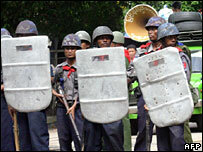 In Burma, the protesters have been faced with an implacable military government. Maybe elements of the armed forces will rebel and overthrow the old guard. But this has not happened yet. In the meantime, the regime has blocked off the media, including the new phenomenon of the internet, which proved instrumental in helping to mobilise opinion abroad. External pressure, in the form of international condemnation and talk of sanctions, has not been strong enough to be decisive. I watched the unfolding events while on a visit to China, and it was interesting to note the approach to events in Burma there. On satellite television, one could see the concern growing in Europe and the United States. This emphasised the way in which the foreign policies of Western governments are influenced by non-governmental organisations, human rights groups and also celebrities. On French television, the actress Jane Birkin was interviewed at length about Burma and the next day led a delegation to see President Nicolas Sarkozy. In China there was none of that. The media almost ignored the crisis in Burma. The first 10 minutes of the nightly news concentrated, as it always does, on the comings and goings of the senior Chinese leadership, which seemed to consist mostly of making speeches. The government in Beijing is not susceptible to influence on human rights grounds. It has a policy of pursuing its own interests world wide (which require the acquisition of large amounts of natural resources) while keeping out of world crises as far as possible. There is only one point of pressure on China - the Olympic Games being held in Beijing next year. The Chinese government is desperate that there should be no boycott. The Olympics are presented as the symbol of China's "peaceful rise", as it is called. So China has to pay some attention to world opinion. That has led to it calling for restraint in Burma, but not much more. The prospect in Burma now is for another lengthy campaign for democracy of the kind that has had to be waged since the last major crackdown in 1988. There will always remain the hope among activists, though, that one of the other decisive factors can suddenly turn things around.